Individuals interested in the Acadian Martins have long wondered if Pierre Martin and Barnabé Martin, the two Martin men first found in Port Royal in the 1671 census, are related. They have also wondered who Barnabé’s father is. Several published genealogical compilations have answered both questions. Unfortunately, no official document exists which justifies their answers. Established and respected dictionaries also publish the error and thus extend it. One is the Dictionnaire National des Canadiens-Français (1608-1760). The entry for “MARTIN, Barnabé,” lists his parents as “Robert [Martin] et Marguerite Landry de France.”2 Since the Dictionnaire is so well known, and its first edition came out in 1965, we have had the past 35 years for the error to be copied by conscientious hobbyists who copy exactly what the trusted reference tomb gives them. The effect of the above serious publications shows up in informal genealogies which perpetuate the view that Robert is the brother of Pierre and the father of Barnabé. Remember Us: Historical, Biographical, Pictorial, an undated, privately printed family genealogy, devotes three paragraphs to Robert Martin, “the son of René Martin and Éstiennette Poyrier.”3 The writers do not provide a source for their data. Since major research libraries collect family histories like this one, the unsubstantiated answers to my two opening questions will continue being perpetuated every time an enthusiastic descendent pulls down the volume and bolts for the copy machine. The reason is simple: most of us treat what is in print as true, or it would not have been printed in the first place. Thus future genealogy buffs using library collections of privately printed family genealogies done by less-than-careful enthusiasts, more formal compilations like Léopold Lanctôt’s, or reference works like the Dictionnaire are likely to repeat this error as gospel. The error has been so often repeated that we might even call it the Apocryphal Gospel of Saint Martin! One serious genealogist, C.-J. 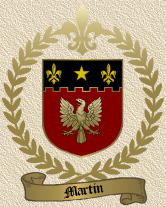 Entremont, addressed the matter in an article published in the journal for Martin descendants.4 The article informed Acadian Martin family members that the available documents do not support the connection made between Pierre and Barnabé or between Barnabé and Robert. It is time to repeat his message. Here are the facts; sources for them will be cited in following paragraphs. 2. There is no Robert Martin included in any baptism, marriage, or burial entry in the registers for Saint Jean-Baptiste, the church at Port Royal. 3. There is no Robert Martin in the first census of Port Royal in 1671. 4. Barnabé Martin first shows up in the 1671 census of Port Royal residents with a wife and two children, one 4 years old and a second 8 months old. 5. The name, Robert Martin, is among the signatures on the 16 August 1654 surrender document of Port Royal to the New England forces under Major Robert Sedgewick. All the English signatures are in a separate column, and Robert Martin’s signature is in the column of English names. Careful genealogists like Stephen White, a lawyer by training, draw only those conclusions which can be supported by official documents. White’s Dictionnaire Généalogique des Familles Acadiennes (Moncton, NB: Centre d’Études Acadiennes-University de Moncton, 1999) gives us what careful genealogists should: facts from official documents and conclusions based on logical deductions necessitated by the facts in those official documents. His entry for Barnabé Martin in the DGFA is a model for all genealogists.5 Since no official documents exist in the New World which identify Barnabé’s parents or relatives, White lists none. Since the 1671 census record says that Barnabé was 35 years old, White concludes that he was “n v 1636,” that is, born about 1636. People who are 35 years old in a given year had to be born 35 years earlier. Since Barnabé had a four-year-old child in the household, White infers that Robert and his wife married no later than “v 1666,” that is, about 1666, a year before their first child was born. Human gestation usually takes nine months, so adding a year to the oldest child’s age gives a reasonable approximation of the latest year the marriage likely occurred. Note that White assumes the couple is married and that the children in the household are theirs, both reasonable assumptions given their Catholic community. Good genealogists use the methods of good historical research. One practice is to look at a variety of statements to find consistency and to evaluate each for accuracy. Another practice is to give more value to documents created closer to an event than to those created many years later. Using these practices, Stephen White has found the origin of the error now so widely spread. During the 1755 deportation, some Acadians were shipped to England for the duration of the war. They were relocated in France in 1763 after the war. Some of them were settled in Belle-Ile-en-Mer in Brittany where an effort was undertaken to reconstruct a register of their baptisms, marriages, and deaths from their memories. In DGFA, White tells us how that went for Marie-JosPphe Martin: “La déclaration B Belle-Ile-en-Mer de Louis Courtin, époux de Marie-JosPphe B Michel B Étienne Martin, dit que les pPre et mPre d’Étienne s’appelaient René Martin et Marguerite Landry (Doc. Inéd. vol. III, p. 27).”6 It turns out that Courtin was an Irishman who married Marie in Ireland in 1761. Marie’s father died when she was only six years old, she was only 14 when the deportation occurred, and her mother died during the deportation period. As White puts it, “Marie-JosPphe Martin n’avait aucun répétiteur pour l’aider B remonter au premier Martin de sa lignée en Acadie.”7 It only makes sense that her recollection was prone to error. White properly gives more credence to an official document, the register of baptisms and marriages at the church of Saint Jean-Baptiste in Port Royal, each entry made at the time of the event, than he gives to a recollection over a hundred years later across the Atlantic by someone who had many reasons for not remembering correct information. Although White’s work uncovers the root source of the error, we are still left with this question to resolve: who is the Robert Martin who signed the August 1654 surrender document? Is it still possible that he is French, or is he for sure English? The remainder of this note presents the research I have done with accompanying reasoning to answer these two interrelated questions. First, we must first look to the Martin surname itself. Some surnames are reasonably limited to one language or country. Other surnames are found in many countries. Martin, it turns out, is one of the latter. The Encyclopedia of American Family Names tells us that the surname has “Czeck, Danish, Dutch, English, Flemish, French, German, Irish, Norwegian, Scottish” origins.10 And that does not include English, French, Italian, German, Swedish, and Dutch transformations and cognates (such as Marten, Martineau, Martinelli, Martensen, Martensson, and Martens). Martin is not a rare surname. Not only is the Martin surname found in at least ten European countries, it is very common in New France during the seventeenth and eighteenth centuries. The Programme de Recherche en Démographie Historique (PRDH) at the University of Montreal has determined that the Martin surname is the 12th most common surname among the more than 710,000 individuals found on a record in Quebec between 1621 and 1799.11 Work done by Émile Martin indicates that there are many distinct lines of Martin ancestors in New France. He has uncovered 55 separate branches of Martins in the Canadian Maritimes. All 55 branches originate from France, and 20 of those 55 came before 1700.12 Many different Martins came to New France in its early years, forcing us to question whether any two we encounter are related. Émile Martin’s listing does not include the many Martins who came from several countries and settled in the American colonies from New England through the Carolinas. Filby and Meyer’s Passenger and Immigration Lists Index lists three pages of Martins who came to the New World, several in the seventeenth century.13 One was Robert Martin who came to New England a year ahead of Pierre Martin’s arrival in Acadia. (More on him later.) From this information alone about the surname, we must at least conclude the possibility that the Robert Martin who signed the 1654 surrender document is of some nationality other than French. It is wise to look at someone else’s work for confirmation. Bona Arsenault used Acadian church registers and censuses for his Histoire et Généalogie des Acadiens.15 To make use of his multi-volume work easier, Phoebe Chauvin Morrison created an index, organizing it by settlement location. An examination of each of her indexes also shows that the only given name beginning in “R” is “René,” and that at Port Royal16. Thus, Arsenault’s work supports an examination of the two Reiders’ work, and we must conclude there is no extant document showing that a Robert Martin lived in Acadia in the seventeenth century. Yet another resource to check is The French Canadians, 1600-1900. It is a database assembled by the Genealogical Research Library of references to individuals in archived documents. The earliest date that the name Robert Martin shows up in the database is in 1871 in St. Epiphanie.17 Two years later, in a companion volume, The Atlantic Canadians, 1600-1900, we find the earliest date that the name Robert Martin shows up is 1783, and that Robert was likely English since the record says he was a “loyalist.”18 The first instance of a Robert Martin who could be an Acadian is “Martin, Robert, farmer, living in 1896 in Madawaska County,”19 and he came on the scene almost 300 years too late to be Barnabé’s father. All other instances of a Robert Martin in both publications are in the late 1800s. Had a record existed, Elliot, the editor, would have picked it up as he did for “Martin, René, living in 1671 in Port Royal NS (Acadian)” (II, 2066). Here too, we are forced to conclude that there was no Robert Martin in Acadia in the seventeenth century. The absence of Robert Martin in the registers of Saint Jean-Baptiste, in the censuses taken of Port Royal residents, or in other archival documents available to researchers is fairly conclusive evidence that Robert Martin was not among the long-term residents of Port Royal in the 1636-to-1671 period when the settlement was becoming established and Barnabé Martin was beginning his family. The absence of the name in the church registers and censuses also suggests that no Robert Martin ever lived at Port Royal between 1636, when d’Aulnay’s group came over on the Saint Jehan, and 1755, when the Acadians were deported. It is hypothetically possible that a French Robert Martin lived at Port Royal briefly, but the documents currently available to us do not let us conclude that. Third, we must look at documentation found in New England. And there we find a Robert Martin among those who laid siege to the fort at Port Royal in late July 1654. To see how this Robert Martin showed up at Port Royal in 1654, we need to look at the documents leading up to the attack. When we look at the signatures on the surrender document for Port Royal, we find that Rev. PPre Léonard de Chartres, Robert Bourgeois, and Guilaume Trouën [Trahan], signed in one column, while Robert Sedgwick, Robert Salem, Marke Harrison, Robert Martin, and Richard Morse all in another column.24 We already know that two of the English signers, Martin and Harrison, are the captains of the ships Hope and Church; it is likely that Morse and Salem are the captains of the ships Augustine and Black Raven. The copy of the capitulation document in the Archives National indicates that the document was “fait et passé ce seizPime d’aoust mil six cent cinquatre quatre, stile de forme B bord du Navire L’amiral nommé L’auguste, etant ancré dans la RiviPre et devant le fort du Port Royal.”25 Thus from Leverett’s letter, we know that all four ships sent from England by Oliver Cromwell, the Church, the Hope, the Augustine and the Black Raven, participated in the attack and that the captain of one of them is Robert Martin. From the surrender document itself, we know that it was written on board one of the ships, the Augustine. What these documents tell us is that the Robert Martin who signed the 1654 surrender document at Port Royal is definitely English. Robert Martin would have been 63 at the time of the attack on Port Royal. Thus, his age may have permitted him to be excused from serving. In any event, since the Plymouth Colony men “were discharged” after news of peace with the Dutch arrived, it is unlikely that this Robert Martin was at Port Royal fighting on the English side. In sum, we know that the Martin surname is common in ten countries and very common in seventeenth century New France. That fact alone forces us to suspect that any two given Martins in the New World may not be related. We also know that there is no documentation which would put a French Robert Martin in Port Royal in the middle 50 years of the seventeenth century, whereas we do have documentation that the first time French (not English) Martin parents named a son Robert in Eastern Canada is in the late nineteenth century. Those twin facts force us to reject speculation that there was a Robert Martin in Port Royal in the 1600s. Finally, we have documentation to support the fact that an English Captain Robert Martin of the ship Hope accompanied Sedgwick on his expedition against the three French forts in 1654 and was a signer of the surrender document with his fellow English navy captains. Given the information at hand, careful thinkers should conclude (a) that no French Robert Martin lived at Port Royal in the seventeenth century and (b) that the Robert Martin whose signature is on the 1654 capitulation document is English. That leaves us with one question yet unanswered, and I end this note with Father Entremont’s answer to it in his 1988 note cited above: “Qui donc était en réalité le père de Barnabé Martin et comment était-il parent avec Pierre Martin? Je ne sais pas” (p. 155). 1 Léopold Lanctôt, Familles Acadiennes (Ottowa: Éditions du Libre-Échange, 1994), vol. II, pp. 160, 166, 167. 2 Dictionnaire National des Canadiens-Français (1608-1760), édition revisée (Montréal: Institut Généalogique Drouin, 1985), vol. II, p. 910. 3 Lucien T. and Melba B. Martin, Remember Us: Historical, Biographical, Pictorial (np: np, nd), p. 128. 4 C.-J. Entremont, “Les pionniers des Martin d’Acadie: Pierre et Barnabé,” Entre Nous, les Martin, 7 (1988), pp. 147-155. 5 Stephen White, Dictionnaire Généalogique des Familles Acadiennes (Moncton, NB: Centre d’Études Acadiennes-University de Moncton, 1999), vol. II, pp. 1128-1129. 6 White, DGFA, II, 1139. His citation is to Le Canada Français. See note 8 below. 7 Details about Marie-JosPphe come from Stephen A. White’s article, “Corrections aux ‘Notes Explicatives, sur les Déclarations des Acadiens conservées B Belle-Isle-en-Mer, et les Établissements des premiers colons de l’Acadie’ de Edmé Rameau de Saint-PPre,” Les Cahiers de la Société historique acadienne, 15 (1984), 116-121. The section of White’s article dealing with Martins is on pages 119-120. 8 Edmé Rameau de Saint-PPre, “Notes Explicatives, sur les Déclarations des Acadiens conservées B Belle-Isle-in-Mer, et les Établissements des premiers colons de l’Acadie,” Le Canada-Français, Collection de documents inédits sur le Canada et l’Amérique (Québec: Imprimerie de L.-J. Demers & FrPre, 1890), III, 141, as quoted by White in his “Corrections aux ‘Notes Explicatives'” article, p. 119. 9 White cites two works that Upper Saint John Valley Acadians turn to with regularity: Henri Langlois, Dictionnaire généalogique du Madawaska (Saint-Basile: Ernest Lang, 1971), IV, 93, and Adrien Bergeron, Le Grand movement des Acadiens au Québec (Montréal: Les Éditions Elysée, 1981), vol. VI, p. 29. 10 H. Amanda Robb and Andrew Chesler, eds. Encyclopedia of American Family Names (New York: Harper Collins, 1994), p. 425. 11 See the top 50 surnames at http://www.genealogie.umontreal.ca/en/NomsPrenoms.htm. 12 Émile Martin, “Souches des Familles ‘Martin’ en Nouvelle France,” Entre Nous, les Martin, 9 (September 1990), 144-155. 13 P. William Filby and Mary K. Meyer, eds., Passenger and Immigration Lists Index: A Guide to Published Arrival Records of about 500,000 Passengers Who Came to the United States and Canada in the Seventeenth, Eighteenth, and Nineteenth Centuries (Detroit: Gale Research, 1981). 14 Milton P. Rieder and Norma Gaudet Rieder, Acadian church Records: Volume III, Port Royal, 1702-1721 (Metairie, LA: np, 1977), Acadian Church Records: Volume IV, Port Royal, 1716-1729 (Metairie, LA: np, 1983), and Acadian Church Records: Volume V, Port Royal, 1730-1740 (Metairie, LA: np, 1983). 15 Bona Arsenault, Histoire et Généalogie des Acadiens, rev. ed. (Québec: Leméac, 1978). 16 Phoebe Chauvin Morrison, Index to Bona Arsenault’s “Histoire et Généalogie des Acadiens” (Houma, LA: P. C. Morrison, 1990). 17 Noel Montgomery Elliot, Ed., The French Canadians, 1600-1900: An alphabetized Directory of the People, Places and Vital Dates (Toronto: Genealogical Research Library, 1992), vol. II, p. 2014. 18 Noel Montgomery Elliot, Ed., The Atlantic Canadians, 1600-1900: An alphabetized Directory of the People, Places and Vital Dates (Toronto: Genealogical Research Library, 1994), vol. II, p. 2066. 20 Collections of the Massachusetts Historical Society, Fourth Series (Boston: the Society, 1854), II, 230). 21 Thomas Birch, Ed., A collection of the State Papers of John Thurloe, Esq; Secretary, First to the Council of State, and afterwards to the Two Protectors, Oliver and Richard Cromwell (London: Thomas Woodward and Charles Davis, 1742), vol. II, p. 419. 22 Birch, A Collection of the State Papers of John Thurloe, vol. II, p. 426. 23 Birch, A Collection of the State Papers of John Thurloe, vol. II, p. 425. 24 “Capitulation de Port Royal,” Archives Nationales [de France], Colonies © II D), vol. I, fol. 98b, copy on file at the Centre d’Etudes Acadiennes, University of Moncton, Moncton, NB. The reader should note that the transcription made by Rameau de Saint-PPre in Une Colonie Féodale en Amérique: L’Acadie (1604-1881) (Paris: Librairie Plon, et Montréal: Granger FrPres, 1889), vol. II, pp. 303-304, is as much excerpt and paraphrase as it is transcription. The serious reader who wants the full document will want to work with a photocopy of the Archive Nationales document (available in the Archives Privées of the Centre d’Études Acadiennes, University de Moncton, Moncton, NB). 25 “Capitulation de Port Royal,” Archives Nationales [de France], Colonies (C II D), vol. I, fol. 98b. 26 Details of Robert Martin’s life are provided in Henry Joseph Martin’s Notices, Genealogical and Historical, of the Martin Family of New England, Who Settled at Weymouth and Higham in 1635, and were among the First Planters of Rehoboth (in 1644) and Swansea (in 1667), with Some Account of Their Decendents (Boston: Lee and Shepard, 1880). 27 Plymouth Colony Records, Volume I, Wills and Inventories, 1633-1669, ed. C. H. Simmons (Camden, ME: Picton Press, 1996), p. 511. 28 Collections of the Massachusetts Historical Society, Second Series (Boston: the Society, 1843), vol. X, p. 60. Click here to view great MARTIN products/gifts! I am very grateful to George L. Findlen, for having provided me copy of his well-documented article (above) and permission to publish same here. George may be contacted at : 1008 Rutledge Court Madison, WI 53703-3824 Telephone: (608) 251-0912. George originally published this article (in English) in Les Cahiers of the Société Historique Acadienne, 32 (juin 2001), 76-86. It has since been reprinted in Je Me Souviens, 26 (Sprint 2003, 5-13, in The Connecticut Maple Leaf, 11 (Summer 2003), 19-26, and it will be printed in French in l’Estuaire Généalogique 90 (juin 2004). Who was the first Martin to settle in Acadia? The 1671 census of Acadia lists Pierre Martin and Catherine Vigneau in Port Royal as having five children: Pierre, Matieu and three married daughters, Marie, Marguerite and Andrée. Their son Pierre, in a separate listing as “Pierre le jeune aagé de 40 ans”, appears as the husband of Anne Ouestuorouest, and Indian woman, with four sons: Pierre, René, André and Jacques. Matieu never married. It is well documented that he was the first white child born in Acadia, in 1636. In the same census, Barnabé Martin, 35, is listed as the husband of Jeanne Pelletret, 27, and they had two children: Marie 4, and René 8 months. There is no mention however, of a Robert Martin, a wife or children in the census or in later records to my knowledge, except that the capitulation of Port Royal in 1654 was signed, among others, by a Robert Martin. Had the terms of the capitulation required this man to return home? Stephen A. White (a genealogist at the Center of Acadian Studies at the University of Moncton), has written that “in the case of Robert Martin, all that is known of him, is that he signed the capitulation in 1654. No documentation has been found to show that he was related in any way, either to Pierre Martin or to Barnabé Martin.” Elsewhere, he calls attention to the fact that the Robert Martin signature appears among the English (rather than among the French) signers of the capitulation. Whether Robert Martin, signer, was French or English, remains an important question to be resolved by documentary evidence. Perhaps British archives might shed some light on the subject. Meanwhile, there is a respectable school of thought that proclaims Robert Martin and Marguerite Landry as the progenitors of the Martins of Acadia. This school apparently retains its faith in the early writers on this score, i.e. that Pierre Martin had a brother named Robert— referred to by Placide Gaudet, as Barnabé. As a genealogy buff, I am not in a position to gainsay the venerable writers of the past (and present), but as a lawyer, I must await proof that Pierre had such a brother. Until then, I know only that my particular line of Acadian Martins goes back to RENE, the 8-month son of BARNABE and JEANNE as the progenitors of most of the Madawaska Martins. Whether they come from the Province of Anjou, as did Pierre, remains to be determined, as does the question whether they were born in France or Acadia. I have them listed among the emigrants from somewhere in France. Barnabé Martin (1636 – pre 1686) married Jeanne Pelletret (1643 – 1706), the daughter of (Unknown) Pelletret and of Jeanne Bourg, at Port Royal in 1667. SGCF confirms this date, stating that “Jeanne Pelletret married Barnabé Martin in 1667 and Jacques la Vanier dit Langevin in 1687.” Historian Bona Arsenault describes Jeanne as “originaire de Paris.” The 1686 census lists 45-year-old Jeanne as the “widow” of Barnabé. Acadian church records show that Jeanne PELLETRAY died January 10, 1706 at age 63. Barnabé Village, across the Annapolis River from Pierre Thibodeau’s Prée Ronde (Round Hill), was named after Barnabé. Closing Comment: As noted in the FIRST article, Robert Martin was an English sea captain, not a Frenchman, and definitely not Barnabé’s father! I am very grateful to my uncle Roch Cyr, for having provided me a copy of this source document, originating from his friend, Leo G. Cyr.